This vintage Victorian brooch is embellished with multicolor crystals. This extremely feminine and gorgeous brooch can be pinned to an attire, saree, dupatta or hair. 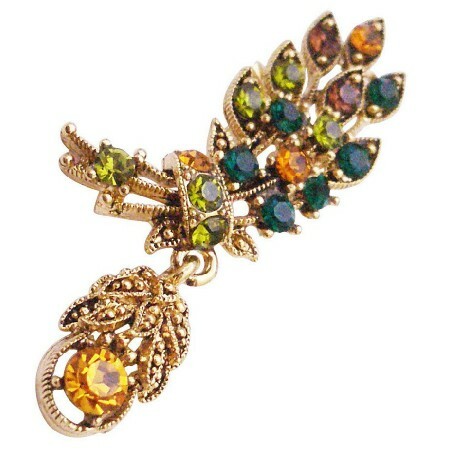 Material Used : Flower shaped antique gold plated metal alloy brooch in multicolor crystals with a metal pin clasp. Buy Antique Gold Leaf Brooch with Dangling Multicolor Crystals, sold & shipped by Fashion Jewelry For Everyone where you can shop online for Leading Online Retailer for Indian Fashion Jewelry. This Brooch, Pins & Bands collection has been tagged as brooch, saree pleat, pins, cake decoration, bridal, saree clip.